Malissa and I have talked about including more recipes here at AJR. We think our recipes should match our site and be colorful, sweet and perfect for a celebration! But we’ve both been on a bit of a health kick lately, making a lot of ingredients in that kind of food (treats) off limits. That’s where these pancakes come in! They’re free from refined sugars, grains and dairy which makes them the perfect fit for all our our criteria! They’re paleo, GAPS, primal, keto friendly and gluten free, reason to celebrate indeed! I really should preface this by saying they’re not completely paleo friendly. While they are free from sugar (unless you top them with sprinkles…ahem…), dairy and grains they still don’t really meet the mantra of paleo which is to treat your diet as our ancient ancestors did. And those guys definitely weren’t sitting around in a cave eating fluffy pancakes topped with a warm buttery syrup. BUT! Freeing yourself from sugar, grains and dairy is always healthy so if you’re just looking for a little treat without the guilt and not to be a strick paleotarian (paleoite? paleoee??) then these are for you! 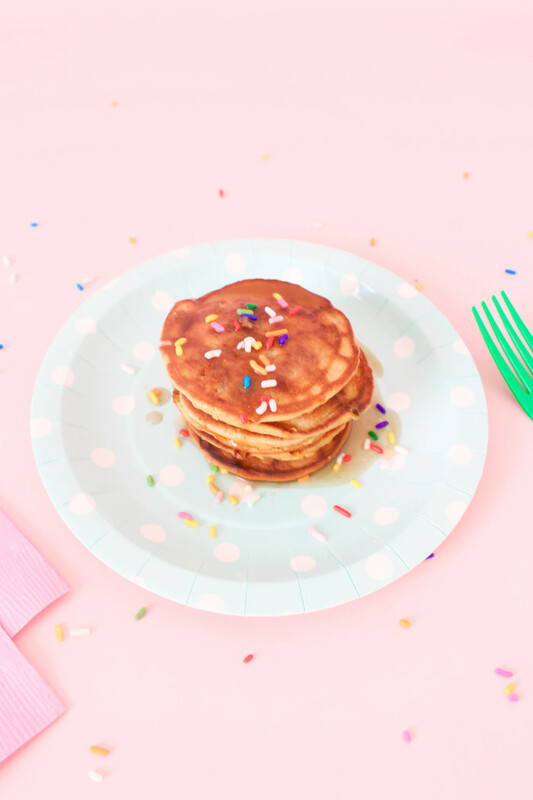 I was so excited when I created these because it was Stella’s birthday and I wanted her to have a special breakfast like I always got for my birthdays growing up (I still do I guess!). I’ve mentioned here before that I’ve tried to keep Stella’s diet healthy and she loves paleo pancakes. 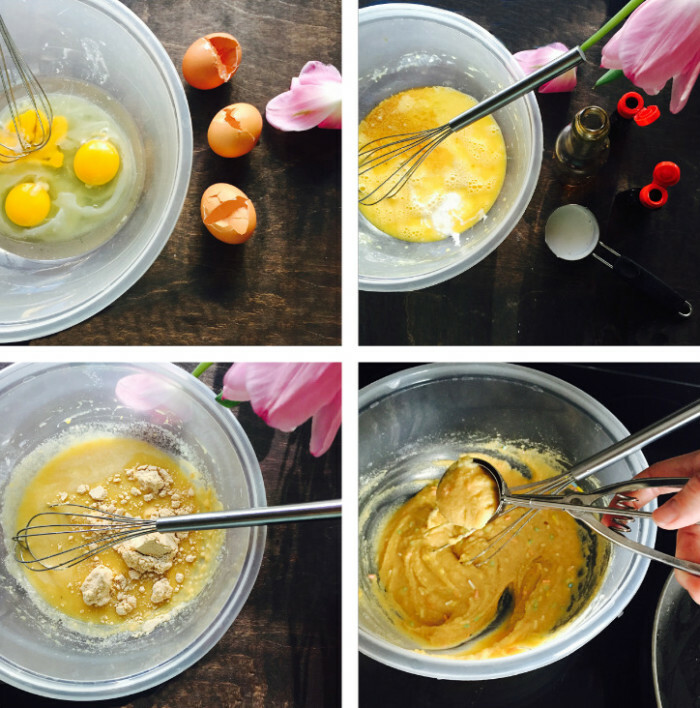 But I couldn’t find a recipe for cake batter ones anywhere and cake batter is pretty much necessary on your birthday! So I started thinking about the flavors the make up cake batter and came up with this winning combination in a coconut flour base. 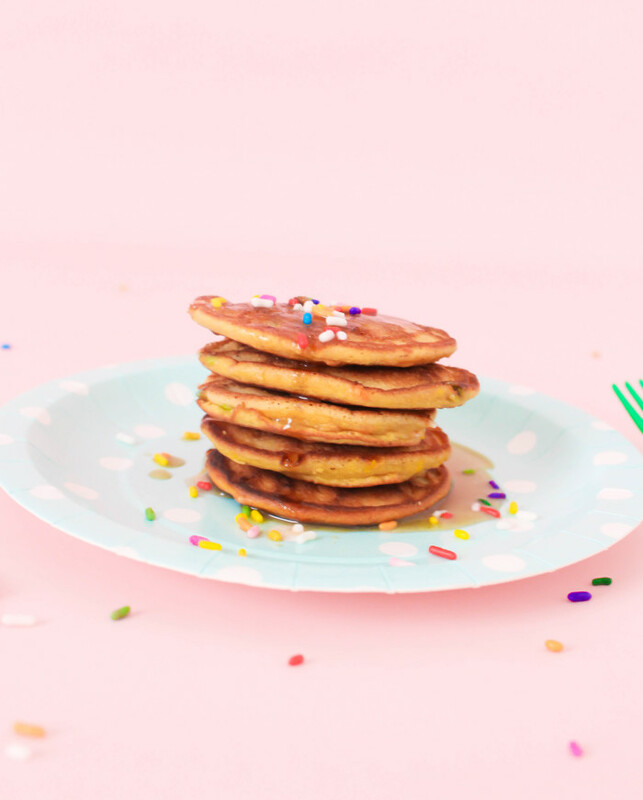 K. As all things paleo, these pancakes do not taste like a fried scoop of powdered box mix. 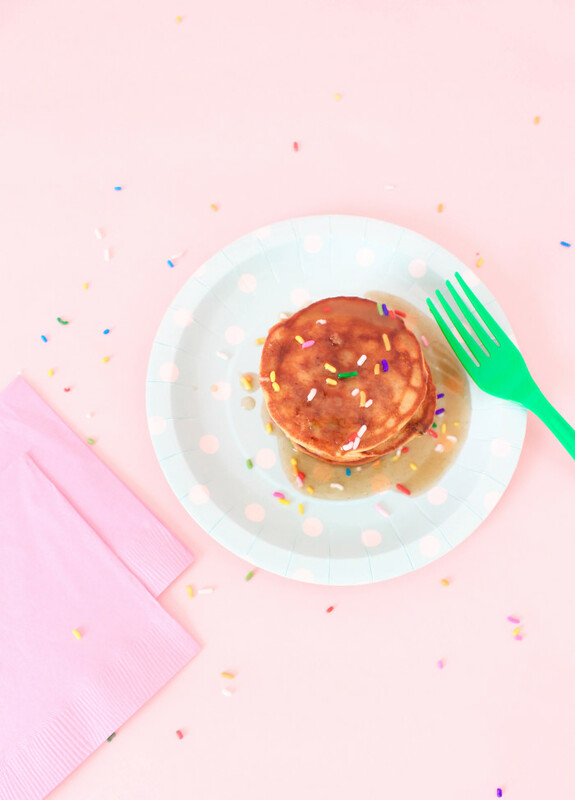 But they still have a definitely birthday flavor to them, are really yummy, have the best batter I’ve ever worked with in a paleo pancake and my baby LOVED them! Wait, wait, so did I! The syrup isn’t really thick but it also has a cake batter/buttery flavor and is perfect for these cakes, especially warm off the stove! You could use honey in the recipe and that might thicken it up a bit but I never use honey as a sweetener in anything I want to share with Stella. You could also definitely just use pure maple syrup and it would be delicious! I actually didn’t put any syrup on them when I fed them to Stella and they were great that way too. I did let her taste test the glaze when I made it though :) she absolutely approved! 1. Melt coconut oil in your bowl in the microwave first. Then mix eggs and maple syrup/honey quickly before the cold eggs solidify the oil. 2. Add coconut milk and extracts (vanilla, butter and almond). 3. Mix in coconut flour, baking soda and salt (and sprinkles if using). Don’t mix too much. 4. Let sit for a few minutes as you warm your skillet over medium heat so the flour absorbs all the flavors and ingredients. 5. Melt coconut oil in pan. 6. 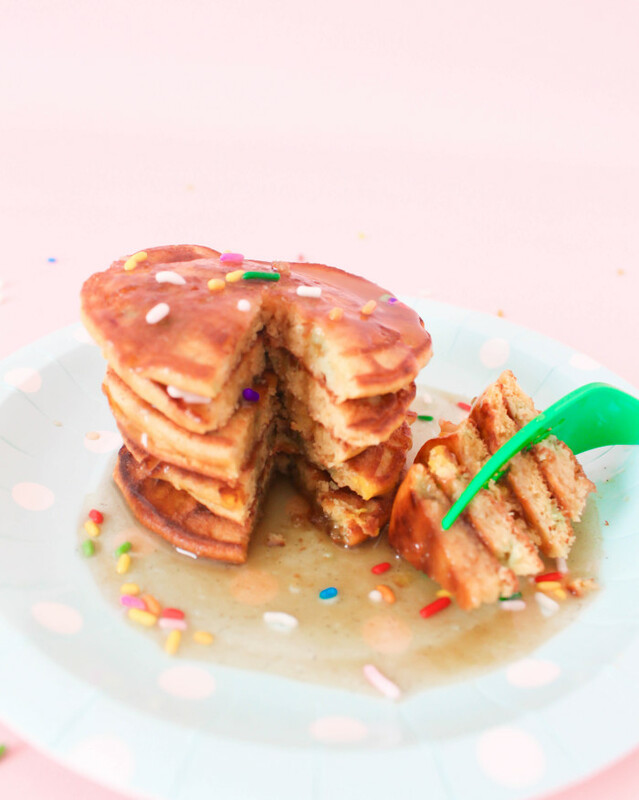 Here is the key to paleo pancakes: keep them small! 2 tbsps is perfect. I use a cookie scoop and then pat the center flatter with the back of it. Also, turn your heat to medium low once you start cooking. 1. Mix all ingredients in a small pot over low heat and let simmer 5-10 minutes. 2. Remove from heat, let sit 5 minutes then quickly whisk until a creamier color is reached. Serve immediately. 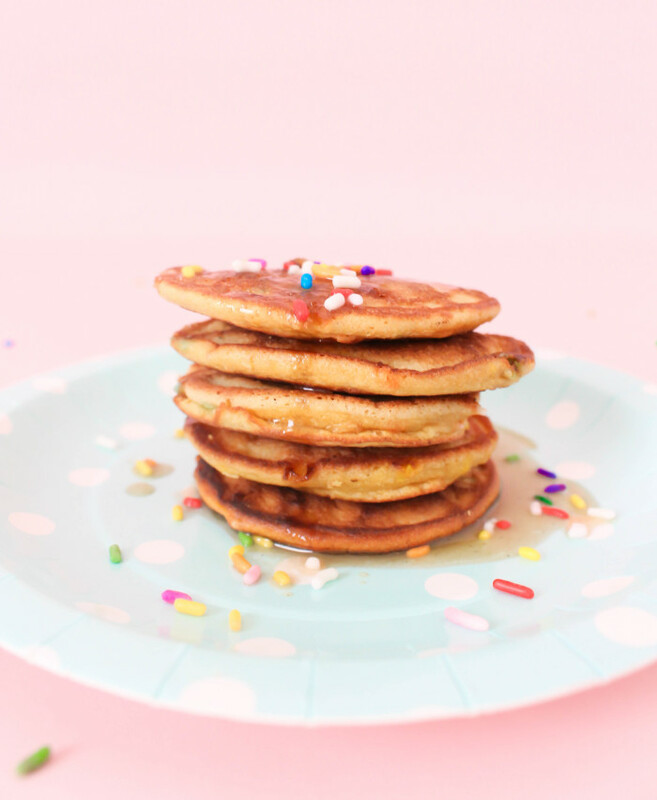 I LOVE pancakes, and these don’t just look amazing; but they sound amazing too! 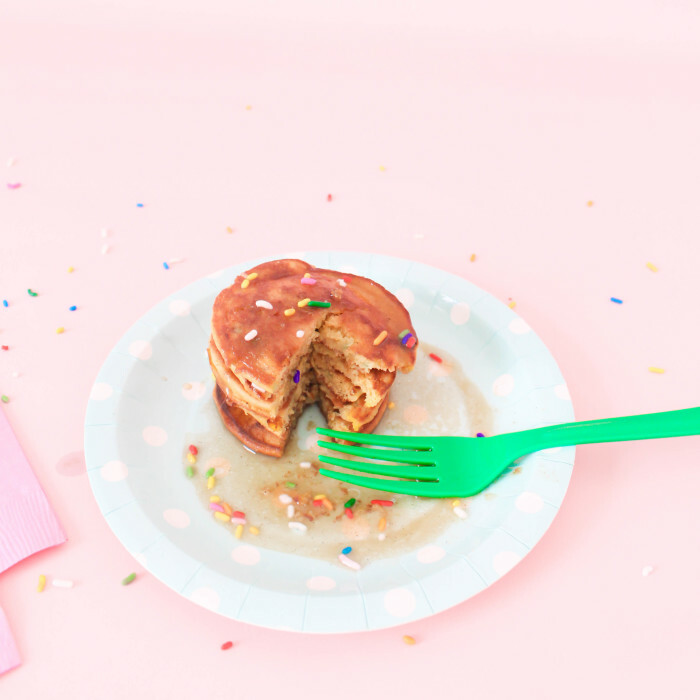 Totally, pancakes are one of the best foods ever!